Strain wave propagation in nonlinearly elastic wave guides is considered. The general idea is how, starting from the first principles, to reduce the initial highly nonlinear elastic wave problem governed by coupled p.d.e. to the only one “double dispersion” equation, describing longitudinal strain waves in a one-dimensional wave guide, e.g., in a rod. This study is aimed to arrange real physical experiments including generation, detection and observation of strain solitary waves in solids. The porblem of wave motion in a rod, having slowly varying cross-section or elastic moduli is solved. Special attention is paid to nonlinear dissipative waves, corresponding to the wave motion in a rod embedded into an active or a dissipative medium. The general approach to find travelling wave solutions for various nonlinear problems with dispersion and dissipation is based essentially on the theorem proved recently, that allows to reduce many autonomous nonlinear dissipative 2nd order o.d.e.’s to the Abel equation of the 1st order. 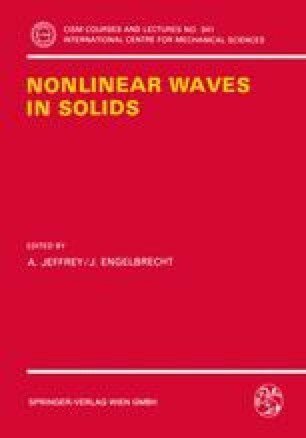 Using the approach, new exact solutions are obtained for some nonlinear wave problems. Finally, some physical experiments concerning strain soliton generation in nonlinearly elastic materials are discussed, in particular, the propagation of a soliton induced by a laser generated weak shock wave and detected by the optical holography method.